Weighing just 10 pounds and featuring the ability to use AC power or a rechargeable battery, the Alma Accent 980 laser machine is a compact and affordable answer for laser-assisted lipolysis, skin tightening and body contouring. It offers a 980nm diode laser that can generate up to 10 Watts of power, and this system only requires the use of local anesthetic. If the cost of a new Alma Accent 980 laser system is out of your reach, you can save up to 60% off the retail price at SunrayLaser.com. 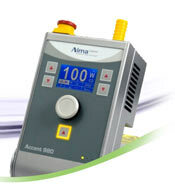 We have pre-owned Alma Accent 980 laser machines for sale with a full satisfaction guarantee so that you can buy with total confidence. A pre-owned Alma Accent 980 system can be outfitted with dual rechargeable batteries and a protective carrying case to allow you to transport it just about anywhere with ease. And if you want to buy a used Alma Accent 980 laser machine with ease, then SunrayLaser.com is here to help. Just contact us using the form below to a get the lowest price quote on an Alma Accent 980. At SunrayLaser.com, every pre-owned cosmetic laser system we sell is backed by our 100% satisfaction guarantee. We also sell quality cosmetic laser machine parts and supplies, so contact us right now to find out how much money we can help you save.